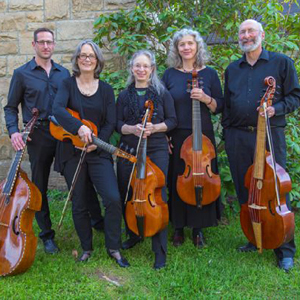 Arcadia Viols, a consort of viols, or ensemble of violas da gamba, has been associated with Arcadia Players of Western Massachusetts since its founding in 2009. The ensemble has performed in many venues in the North East and beyond, including Stratford Music in Ontario. In 2011 and 2015, the consort performed at the Boston Early Music Festival Fringe Festival. Recent performances include J.S. Bach’s The Art of the Fugue at Clark University in Worcester, MA, and at Tufts University; Lachrimae in Hadley, MA, and The Wonder of Will with Stile Antico and the Folger Consort at the National Cathedral in Washington, DC, and in the series Music before 1800 at Corpus Christi Church in New York City. This past season, the ensemble performed its program of adventurous music from the 17th and 21st centuries, Viols on the Edge at Bard College at Simon’s Rock, Mount Holyoke Summit House Concerts and Tufts University. Arcadia Viols joined the Crescendo chorus of Limerock, CT in performances of a program of Elizabethan Music and the Sounds of Hamlet.